There is only one adjective nearly to describe the amazing qualities of the Lifecore R100 Rower Wow! Beyond any doubt in mind, it has been formidably reviewed as one of the optimal available rowers in the market these days. One of its unique features which put it quite ahead in comparison to other rowers is its resistance power both in air and magnetic. If you are a hard borne exerciser, you would simply fall in love with this machine. It helps you to enhance your training sessions and also let you perform tougher activities. Why You Should Buy Lifecore R100 Commercial Rowing Machine? As it has already been stated earlier that the Lifecore rowing machine offers two types of resistance systems- air and magnetic. Now you must be curious to know the advantages it offers. Well, to answer the query, the air helps you to row the machine quite easily. There is a fan attached to it. But pulling through the air can be difficult at times and so to make your task simpler the magnetic resistance has been incepted. It is important to remember at this juncture that the machine will operate through fan resistance at level one. However, as you increase the level, it changes to magnetic level. The Lifecore R100 Rowing Machine has got an in-built monitor display system. A LCD screen has been attached with it which enhances the attractiveness of the machine. It will make your viewing easier while you are exercising even if it is a dark place. The data information regarding the workout is available on the screen. The monitor is operated through four batteries as well as an AC adapter. The display screen is fixed at an appropriate distance so that the exerciser can view the data with ease. It is adjustable according to the height of the individual. As such you can opt between any levels ranging from one to sixteen. In addition, you also have the facility to pre-program the machine according to your physical workout and training up to eleven levels. In fact, this rowing equipment is a boon especially if you want to work out for making the cardiac muscles stronger. The machine has got the facility of data storage up to four users. Moreover, it does not occupy large space for storing. It can be easily folded by just opening the screws underneath the seat. It has got a good capacity. The maximum weight that you can put on this machine is around six hundred pounds or 272 kg. The machine has been strongly constructed so that it can even take a heavy load of a person without any issue whatsoever. The weight of the machine is around 96 Kg or 600 lbs. The seats have been comfortably designed with angled foot and pivoting heel support. You can perform all your exercise activities without facing any problem. Besides, the handles are also ergonomically built. This is not all. The rowing machine has got air vents which can be easily adjusted according to the needs of the exercise. Its main function is to cool you and soak your sweat while doing workout. The Warranty on the Rowing Machine is guaranteed on two factors; Residential and Light Commercial. You get a lifetime warranty on the frame, five year warranty on the parts and one year on labor (for Residential) and ninety days labor and two years on parts (for light commercial). You can easily avail it for various prices around $1299. 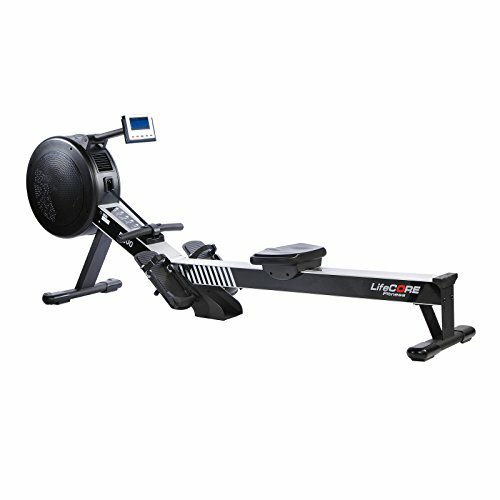 The Lifecore R100 Rower is the best rower on the market today. It's the only commercial-grade rower utilizing both air and Electronic Brake System technology.